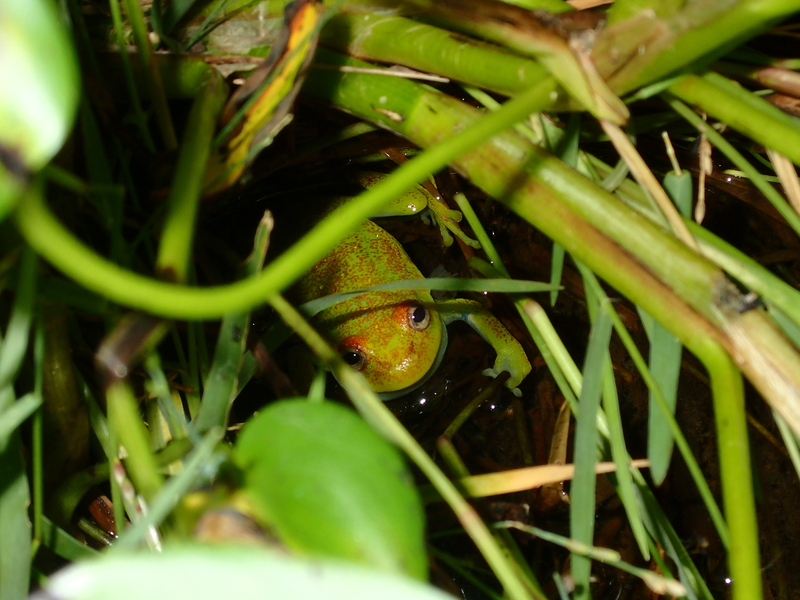 When I was first in the Macquarie Marshes, landholders didn’t know there were at least 15 different frog species, and would simply call everything either a green frog or a brown frog. 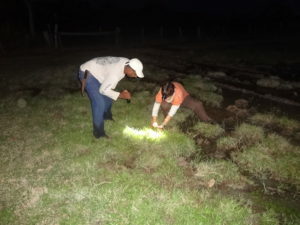 Though after I’d compiled a small identification guide, they’d tell me the proper names of what they’d seen and how many were calling after it rained, and by the time I finished my PhD fieldwork out there, they were all experts! I love telling people about frogs and sharing what I know. Even when on holiday it seems, which is how I ended up doing a guide to the frogs I saw while on holiday in the northern Brazilian Pantanal. 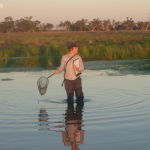 It’s a small wetland frog research world! I’m not an expert on Pantanal frogs, but it turned out that finding some experts wasn’t that hard. It seems that while the world is a large place, the ‘world’ I live in is a bit smaller and mostly inhabited by like-minded people. So when I go on holiday and visit wetlands because that is what I like doing, I’m likely to run into other people who like to be around wetlands. This also increases the likelihood that they might be interested in frogs, maybe even researching them. And if the wetland that I’m holidaying at is a natural analogue for the wetlands that I work on here in Australia, then — apparently — there is a good chance that they’ll have read my research papers! 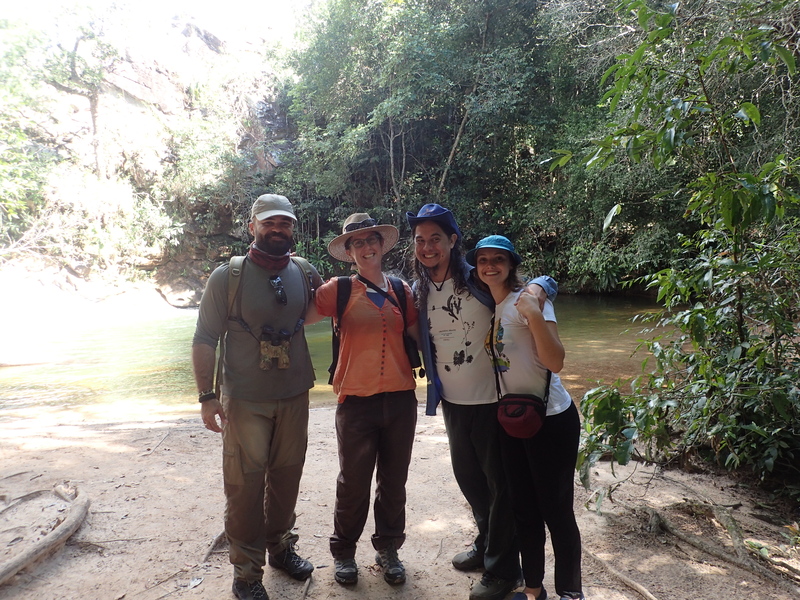 Which is how you run into people who know you, even though you’re in a somewhat remote area of a large foreign country far from home, and is how I met my Pantanal frog experts, the awesome Leonardo, Natalia and Marcos. 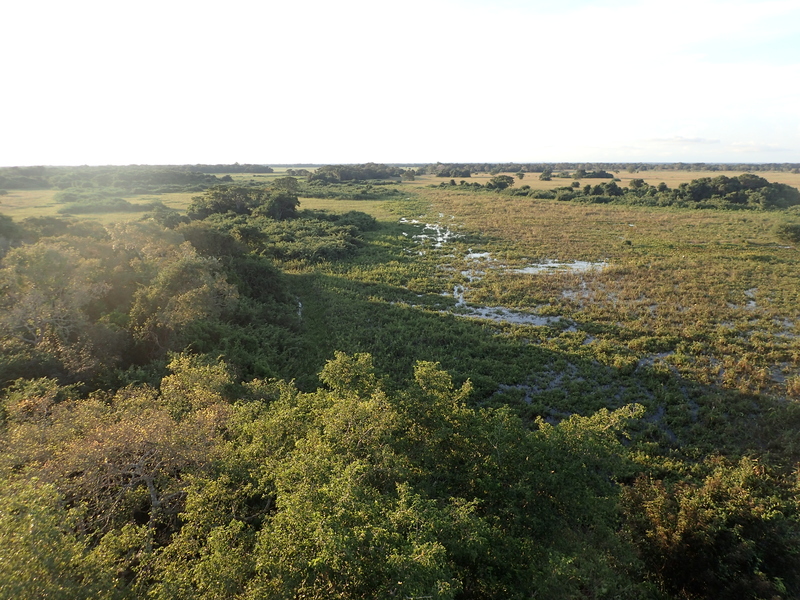 The Pantanal is the largest continuous floodplain in the world. 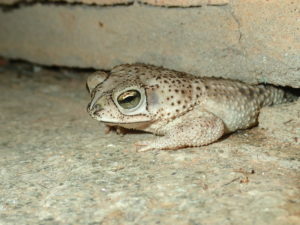 And like any good wetland system has a lot of frogs, as well as a multitude of other spectacular wildlife such as waterbirds (OK we also have them in Australia, but these are different waterbirds), giant spiny anteaters, capybaras, jaguars, anacondas, and caiman to name a few obvious ones. Flooded floodplain in the afternoon light. While I could find plenty of information on these charismatic megafauna, there was a distinct lack of frog knowledge including by the owners and staff of the pousada I stayed at (the wonderful Araras). 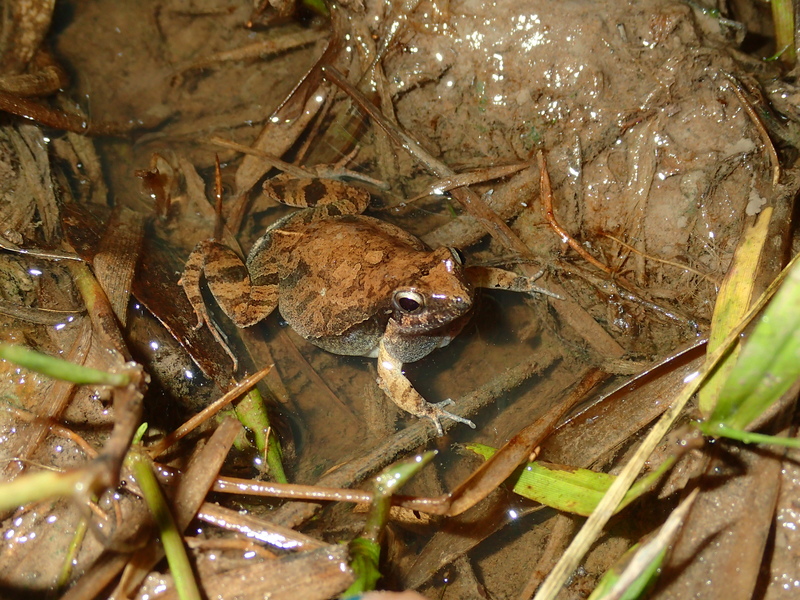 It seems even though they could hear the frogs and were surrounded by them, they didn’t know any of the species and hadn’t met anyone interested in frogs before. Even just showing them photos of what I’d seen the night before opened up a new world for them, species that were totally unknown yet a very present part of the wildlife of the Pantanal. Showing the guide how it’s done. By the end of my stay at Araras, the owners were keen to know more about the frogs and asked me to share what I’d found. 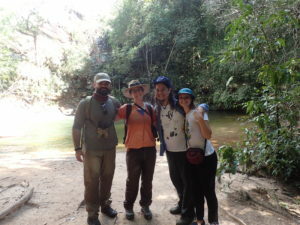 Fortunately, I’d kept in touch with Leonardo, Natalia and Marcos and they could identify the 13 different species I’d seen over the three nights. Seeing as a basic identification guide worked last time, when I got home I put one together of the frogs I saw at Araras. The idea was help the owners and staff know more about the frogs around them and share with any future frog-interested guests (check it out here). I also did one for another amazing pousada I stayed at, Park Eco Lodge at Chapada dos Guimaraes (one in English and another in Portuguese). Considering I was there at the start of the dry season and there are many, many more species that I didn’t see in the Pantanal, I think a second edition might require another visit. Who’s coming? 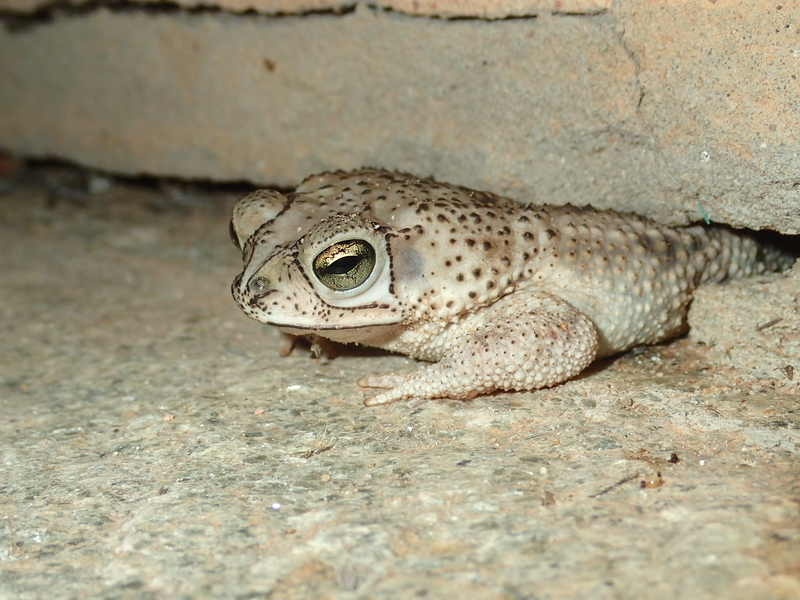 Rhinella major trying to squeeze back under the building. 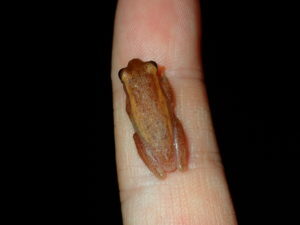 Known as the Formula 1 frog due to the sound males make, Physalaemus albonotatus. PS. The Pantanal was the last stop on my tour of different Brazilian ecosystems arranged by Pantanal Explorer and organised for me by the amazing Lara at Eclipse Travel in Sydney. 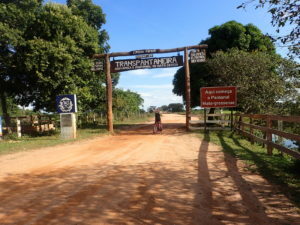 If you want a bang-up Brazilian holiday, email (lara@eclipsetravel.com.au) and tell her I sent you! And if you want do a lot of ticking on your Brazilian bird-list, make sure you request Allan Franco, the best. Copyright © 2019 Joanne Ocock. All rights reserved.